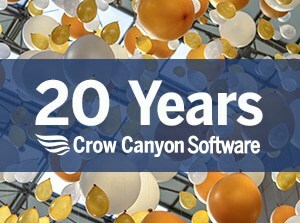 Crow Canyon Systems, Inc., is sponsoring the Utah SharePoint Saturday, to be held in Salt Lake City on February 25. Scott Restivo, CEO of Crow Canyon, will be giving a talk as part of the speaker sessions that run during the day. SharePoint Saturdays are free events, put on by the SharePoint community, to provide educational opportunities in Microsoft SharePoint and Office 365 technologies. The Utah conference will take place at the David Eccles School of Business at the University of Utah in Salt Lake City. The schedule for the event includes sessions throughout the day by leading SharePoint and Office 365 experts. The talk by Scott Restivo will be on “Three Pillars of Application Design”, based on his more than 20 years’ experience building robust applications on Microsoft platforms. Restivo will cover how to use SharePoint and Office 365 to drive user adoption, automate workflows, and provide useful reporting. During the day, Crow Canyon will host a booth and demonstrate its powerful and flexible business applications for SharePoint and Office 365, including Help Desk, Customer Service, Employee Services, Asset Management, HR, Facilities, Marketing, Purchasing, and others. These applications deliver critical functionality to organizations all over the world, including major financial institutions, government agencies, military units, colleges, corporations of all sizes, healthcare companies, and more.